This award winning short film, combining live action and animation, played in the main theater at Disney/MGM Studios' Animation Pavilion. 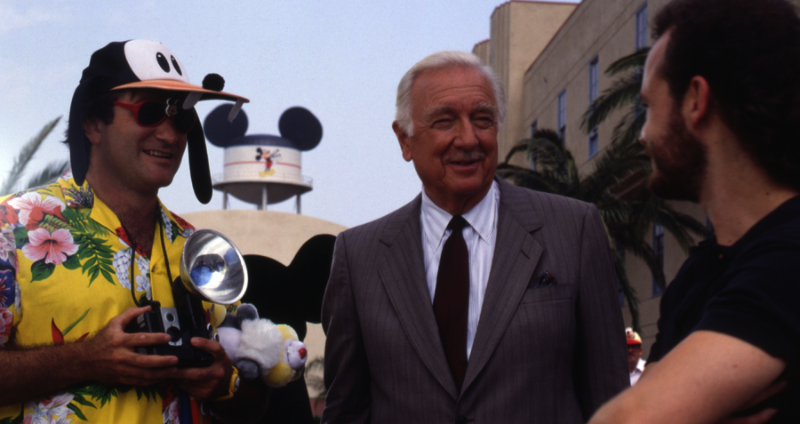 Walter Cronkite, in his familiar role of trusted newscaster, set out to reveal the secrets behind Disney animation. Robin, in the role of Disney World tourist, volunteered to help with Walter's show-and-tell. With a twinkle in his eye, Walter called on his assistant Tinkerbell to transport them to a magical limbo where anything could happen. Rees, who began his career as a Disney Feature Animator, sums it up this way; "It's not how you move the drawings, it's how the drawings move the audience." 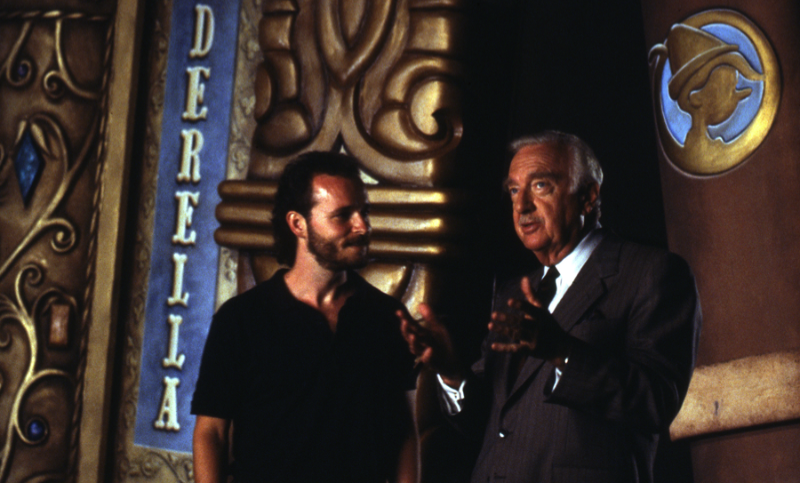 Walter Cronkite discusses a scene with Jerry Rees among giant books provided by Production Designer Craig Sterns. 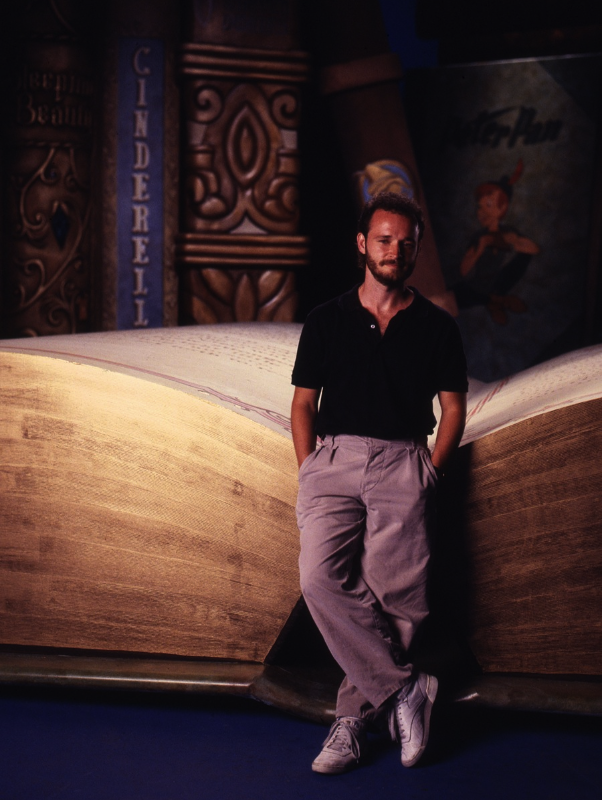 No digital tricks, these books were huge! 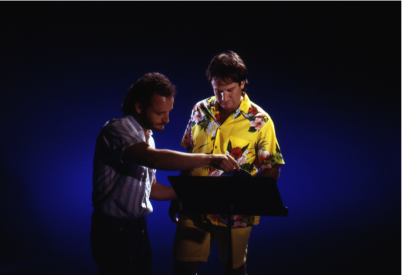 Robin Williams getting ready to fly, as Rees explains the aerodynamics in Neverland. Jerry and Walter getting ready for the "Storyboard" scene. Robin and Jerry in the magical limbo. 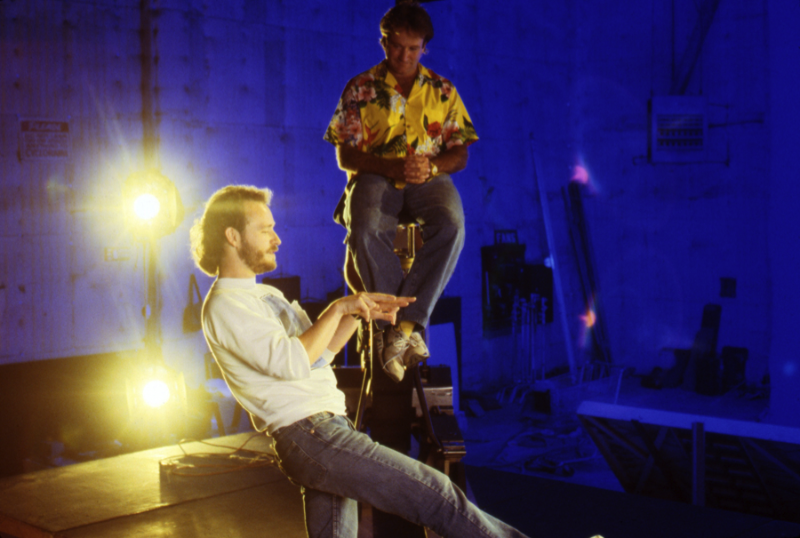 During a break in filming, animator Frans Vischer chats with Robin Williams. 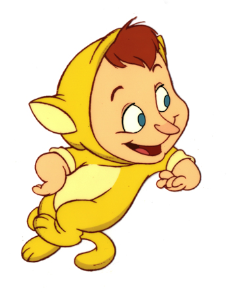 Frans animated an improvisational sequence in "Back To Neverland " in which Robin's character swiftly changed into many forms, including Mickey Mouse and even Walter Cronkite. This scene led directly to Robin being cast as the Genie character in Disney's next feature, "Aladdin". 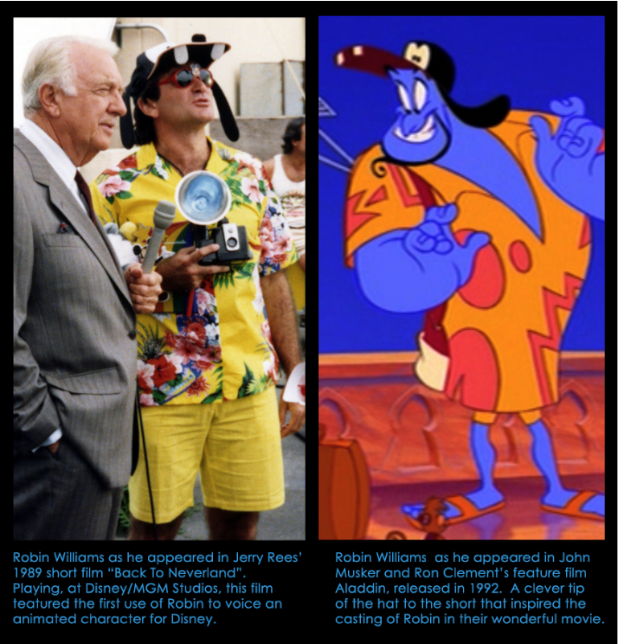 Since Robin Williams' voice track was recorded prior to live action filming, the animators had time to complete some "flipping scenes" to share with him. 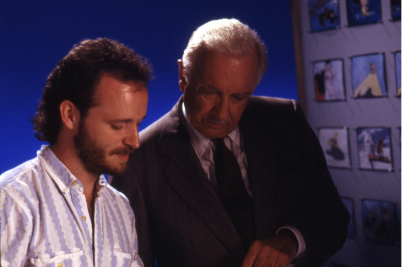 Here, animator Bruce Smith flips a scene of Robin as a Little Lost Boy. Hey, Robin likes it! So does his wife Marsha. 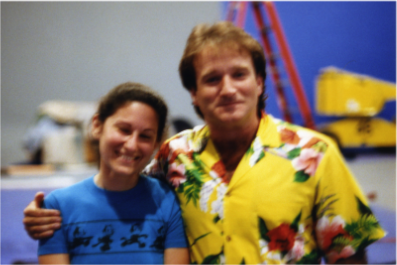 "Back to Neverland" animator Rebecca Rees gets a hug from Robin. She studied videos of Robin, taken during his voice recording sessions, in order to capture the essence of his body language, expression and timing in her wonderful animation. 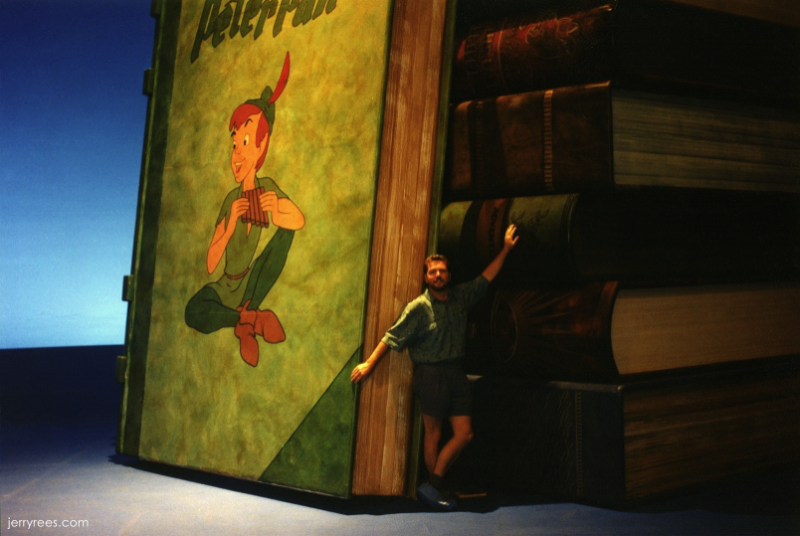 Layout Artist Darrell Rooney getting ready for some serious reading on the "Back To Neverland" set. 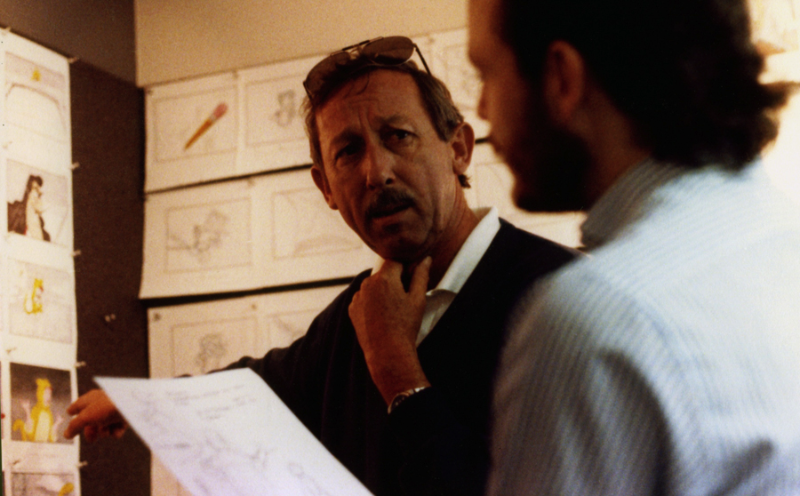 Roy Disney, nephew of Walt Disney, and devoted keeper of the family legacy, discusses storyboards for the Captain Hook showdown with "Back to Neverland" Director Jerry Rees. 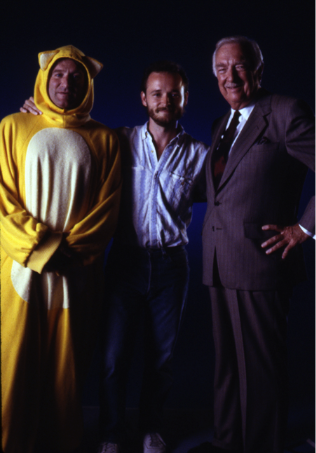 Robin Williams, Walter Cronkite and Jerry Rees prepare for the opening scene. The Mickey Mouse water tower in the background isn't the real thing in Florida, but a large scale model in Hollywood. 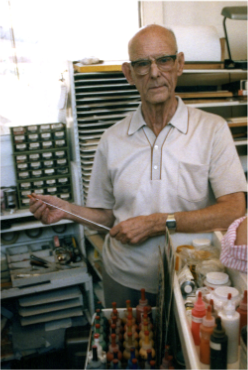 Legendary Disney Artist Ken O'Conner, who pioneered unusual applications of perspective for the original Fantasia, provided color keying for "Back to Neverland". Working from his well-equipped home office, he mapped out the emotional flow of the entire film through thoughtful implications of color. 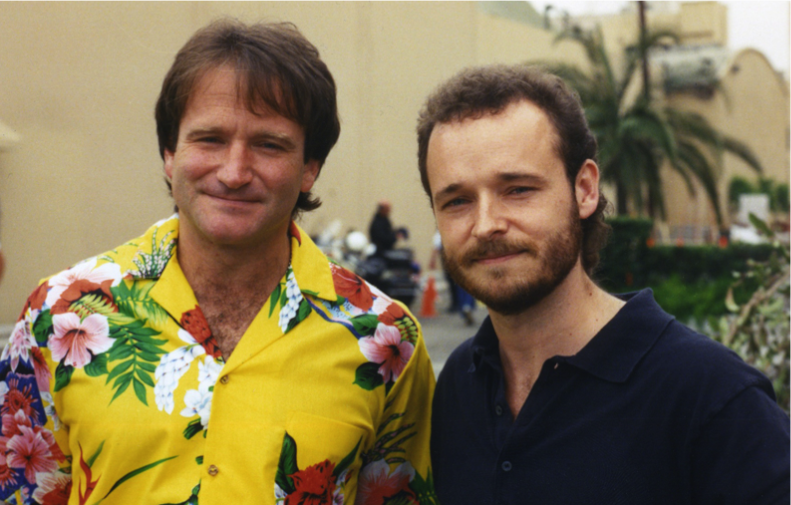 Robin Williams and Jerry Rees looking just a bit like brothers.